The bulls are ready to celebrate! Wall Street closed out a banner year Tuesday with more record closing highs. The Dow Jones industrial average ended at an all-time high for the 52nd time this year. The S&P 500 also ended at a record high. The Nasdaq settled at its highest level in 13 years. U.S. markets will be closed Wednesday for New Year's Day, and few shares were trading hands Tuesday. Investors were tying up loose ends "before heading off to celebrate the end of what has been an exceptionally good year" for stocks, said Marc Chandler, head of currency strategy at Brown Brothers Harriman, in a note to clients. 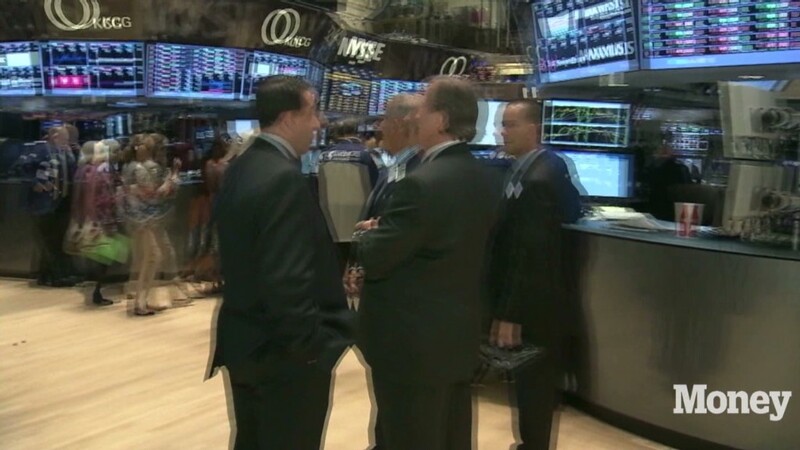 The Dow and S&P 500 have soared in 2013, posting the biggest annual gains since the late 1990s. The Dow was up 26% and the S&P 500 gained more than 29%. The Nasdaq has surged nearly 40%, to highs not seen since 2000. The major gauges were up by between 2% to 3% in December, the fourth month in a row that stocks have risen. How we got here. Stocks have been in a bull market since 2009, but this year's rally has been substantial. Excluding a 5.7% drop from late May through late June, the S&P 500 has not suffered a decline of more than 5% all year. The year started strong, thanks to a political deal to avoid the so-called fiscal cliff that helped clear some uncertainty about the federal budget. The rally hit a speed bump in May after Federal Reserve chairman Ben Bernanke told Congress that the central bank might start to scale back its stimulus measures, a remark that sent the market's rumor mill spinning for months. But investors cheered when the Fed officially announced plans to taper its bond buying program earlier this month, taking it as a sign the economy is improving. As stocks marched higher, investors poured billions into stock-based mutual funds and exchange-traded funds. In 2013, a total of $348.63 billion went into these funds, the largest ever annual inflow on record, according to TrimTabs. Bad news for bonds. The year was not kind to the bond market. A record $72 billion flowed out of bond mutual funds in 2013 as investors braced for fewer Fed purchases. The yield on the benchmark 10-year Treasury is trading above 3%, up from a low of 1.63% in early May. Bond yields rise when prices fall. But it was not just Treasuries that got hit. The Barclays U.S. Aggregate Bond Index (LAG), which tracks investment grade corporate bonds, fell 4% this year. Gold also had a rough year. The precious metal fell 28% in 2013, marking the first down year for gold prices since 2000. What's next? For now, many analysts believe stocks can move even higher in 2014, as a strengthening economy fuels continued growth in corporate profits. But predicting the future can be a treacherous endeavor. 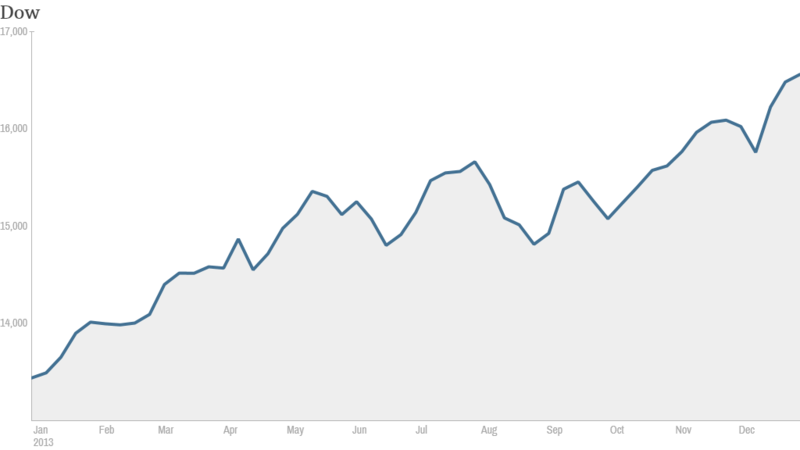 In January, analysts surveyed by CNNMoney predicted the S&P 500 would rise 4.5% in 2013 to end at 1,490. That was off by about 350 points. Netflix takes the cake. The top performing stock in the S&P 500 was Netflix (NFLX), which soared nearly 300% this year. On Tuesday, Netflix disclosed that CEO Reed Hastings will see his scheduled base salary and stock options jump by 50% in 2014. Micron Technology (MU), BestBuy (BBY) and Delta (DAL) were the other top gainers. Newmont Mining (NEM), one of the world's largest gold producers, was the worst performing S&P 500 stock. It fell more than 50% this year. Another mining company, Cliffs Natural Resources (CLF), which is a big producer of coal, sank 32%. Before it was kicked out of the S&P 500 last month, J.C. Penney (JCP) was the biggest loser in the index. Shares of the troubled retailer have dropped almost 54% this year. Global markets join the party. European markets also had a good year. Germany's DAX (DAX) led Europe's main stock markets, gaining 25% in 2013. London's FTSE 100 (UKX) rose more than 14% and the CAC 40 (CAC40) in Paris jumped 18% over the past 12 months -- the best year since 2009 for both indexes. Japanese stocks were among the best performers in the world. Japan's benchmark Nikkei (N225)soared 57% this year as Prime Minister Shinzo Abe unleashed a massive monetary and fiscal stimulus program. It was the biggest annual rise for the Tokyo index in more than 40 years. Stock markets in China lagged. The Shanghai Composite (SHCOMP) fell nearly 7% in 2013. In Hong Kong, the Hang Seng (HSI) rose less than 3% this year.